"Try this smooth, delicious, and authentic Kentucky bourbon ball candy." Mix the butter and sugar; fold in the soaked nuts. Form into 3/4" balls and refrigerate overnight. Line a tray with waxed paper. Melt the chocolate in the top of a double boiler over just-barely simmering water, stirring frequently and scraping down the sides with a rubber spatula to avoid scorching. Roll the balls in the melted chocolate to coat; arrange on the prepared tray. Store in refrigerator until serving. What's cooking in Delaware, Ohio? 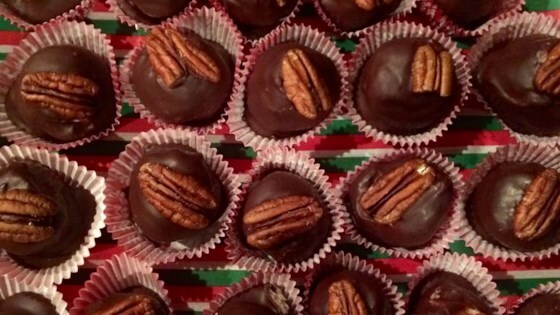 Jessica's tasty Kentucky Bourbon Balls. I made these for Christmas because they are one of my Dad's favorites!! I added a bit more bourbon; that's the way daddy likes them! !